Do you want to look stunning without wasting too much money? Not sure what to look for when choosing cosmetics? Need some advice on skin care? 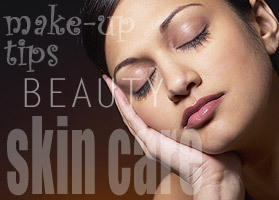 Here are eight tips for naturally beautiful skin to help your skin look and feel it's best. 1) Select moisturizers made with vegetable oils. The lotions, creams and body oils that you use should be made with vegetable oils, not mineral oil. Vegetable oils, (like olive oil, sweet almond oil, corn oil, etc.) contain fatty acids which help to moisturize and soften the skin. Mineral oil is derived from petroleum and does not contain anything that helps to nourish the skin. 2) Look for herbs and herbal derivatives in your cosmetics. Herbs and their derivatives (essential oils, extracts, infusions) contain natural chemicals which soothe, tone and help condition the skin. Two herbs which are especially useful in natural cosmetics are Lavender and Tea tree. The essential oils of both lavender and tea tree are gentle, natural antiseptics. 3) Once a week soak your feet in warm water, and gently exfoliate dead skin with a pumice stone. Follow up by moisturizing your feet with a natural foot oil or foot lotion. 4) Every week soak in a tub of bath salts. Salt, especially salts mined from the Dead Sea in the Middle East, are rich in minerals and help draw impurities out of the skin. 5) After a shower or bath, seal in moisture by using a body oil or lotion made from natural vegetable oils. 6) If you have blemishes and your skin is dry, moisturize your skin in the morning and at night with products that contain vegetable oils which are high in essential fatty acids. Essential fatty acids help to soften and hydrate the skin and they can also help soothe minor irritations. Vegetable oils that contain large amounts of essential fatty acids are: corn oil, sunflower seed oil, safflower oil, borage oil, blackcurrant seed oil and evening primrose oil. 7) Look for toners and astringents that are made without ethyl alcohol, rubbing alcohol or isopropyl alcohol. These ingredients are solvents that are extremely drying to the skin. 8) Every time you wash your hands, moisturize them with a natural lotion or cream to help them stay soft.